Many of us don’t remember to replace light bulbs or batteries until we find ourselves stumbling around in the dark or waking to the mysterious beeps of a smoke alarm at 3 am. Getting into the practice of checking and replacing them at certain times of the year will help you avoid these unfortunate surprises. Lots of people use daylight saving time as a reminder. “Fall Back” and “Spring Forward” also signal a check of batteries and light bulbs around the house. Others use the change of seasons as a prompt for a light and battery check four times a year. Appliances – Check the refrigerator, oven and microwave. Front door – Add a dawn to dusk fixture to keep the bulb from burning out so often. Flood lights – Inspect areas around the perimeter of the house where you don’t frequent. Driveway and walkways – If you have individual lights lining the walkways or driveway, check for ones that have burned out. Garage light – If you get home before dark, you may not know it is out. Batteries, like light bulbs, are usually forgotten until needed. With winter weather approaching it is a good time to check your home’s batteries to make sure everything is in working order. Some important items like lifesaving smoke and CO2 detectors often go unnoticed so check them twice a year. You may not realize that your security system has a back-up battery. Because these batteries are built to last, you may never have replaced it. Consult your owner’s manual to see how to check its power status, what type of battery your system uses and how to install it. Storm outages can drain them so make sure to check them to stay secure this winter. While we are on the topic of storms, it is always a good idea for flashlights and storm radios to be charged. A battery-operated alarm clock comes in handy when overnight storms knock out the power. If power is out for a while your cell phone battery may give out, too. Consider keeping a charged battery pack or solar powered charger available. If being without of power is something you experience every Winter, consider buying a portable generator. They come in a variety of sizes so decide what appliances you want to keep running (refrigerator, stove, heater) to help you pick. There are UPS (uninterrupted power supplies) for your electronics that will help you stay connected and protect them from power surges when electricity comes back on. Don’t get left in the dark. 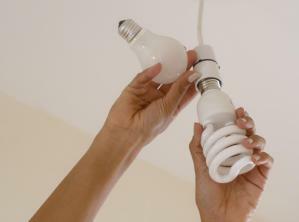 Take the time to check and replace light bulbs and batteries around your home. These little tasks can help keep you safe and protected all year long. From drills and ladders to portable generators and floor jacks, our expert staff is always on hand to help you secure your home and car for whatever Winter throws at them. Want more tips on getting ready for cold weather? Our blog, 4 Cold Weather Basics: Winter Storm Emergencies Pt. 4, has helpful information on what to do during severe weather. As always, if you have any questions about pricing or how-to’s, don’t hesitate to contact us. Stop by our store — we’re open seven days a week.